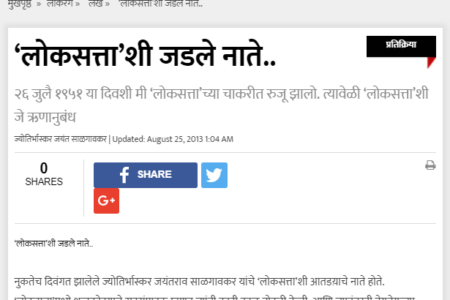 फक्त मराठीच नव्हे तर भारतीय माणसाच्या सांस्कृतिक जीवनावर कालनिर्णयने सांस्कृतिक ठसा उमटवला आहे. 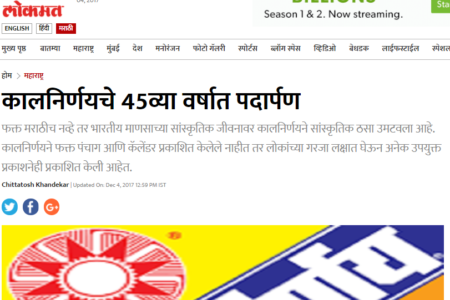 कालनिर्णयने फक्त पंचाग आणि कॅलेंडर प्रकाशित केलेले नाहीत तर लोकांच्या गरजा लक्षात घेऊन अनेक उपयुक्त प्रकाशनेही प्रकाशित केली आहेत. Indians around the world will now be able to check their auspicious tithis and muhurats at the tips of their fingers. 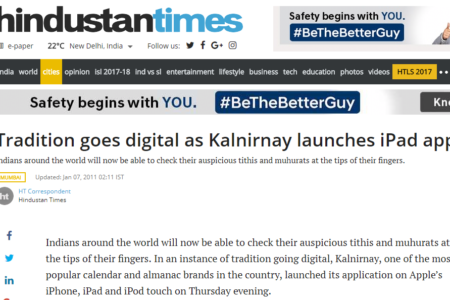 In an instance of tradition going digital, Kalnirnay, one of the most popular calendar and almanac brands in the country, launched its application on Apple’s iPhone, iPad and iPod touch on Thursday evening. 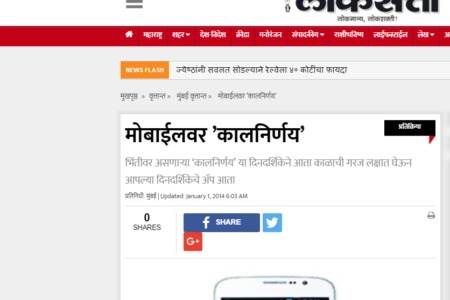 कालनिर्णयने वाचकांसाठी पाकनिर्णय २०२० ही पाककृती स्पर्धा आयोजित केली आहे. या स्पर्धेतून पौष्टिक आणि नावीन्यपूर्ण पदार्थांचा शोध घेण्याचा प्रयत्न केला जाणार आहे. 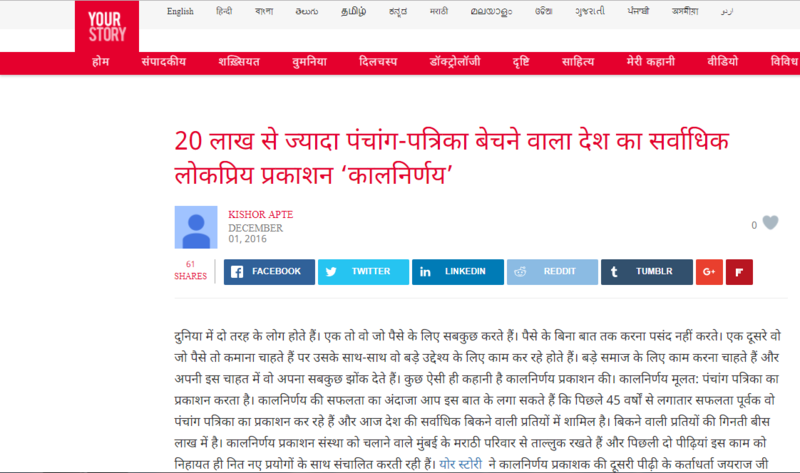 स्पर्धेत सहभागी होऊ इच्छिणाऱ्यांनी खाऊचा डबा, डाळींपासून बनवलेले नावीन्यपूर्ण गोड किंवा तिखट पदार्थ, कोशिंबीर अथवा सलाड आणि जेवणानंतरचा गोड खाऊ अर्थात डेझर्ट या चार श्रेणींमध्ये पदार्थांच्या पाककृती पाठवायच्या आहेत. दुनिया में दो तरह के लोग होते हैं। एक तो वो जो पैसे के लिए सबकुछ करते हैं। पैसे के बिना बात तक करना पसंद नहीं करते। एक दूसरे वो जो पैसे तो कमाना चाहते हैं पर उसके साथ-साथ वो बड़े उद्देश्य के लिए काम कर रहे होते हैं। बड़े समाज के लिए काम करना चाहते हैं और अपनी इस चाहत में वो अपना सबकुछ झोंक देते हैं। कुछ ऐसी ही कहानी है कालनिर्णय प्रकाशन की। कालनिर्णय मूलत: पंचांग पत्रिका का प्रकाशन करता है। कालनिर्णय की सफलता का अंदाजा आप इस बात के लगा सकते हैं कि पिछले 45 वर्षों से लगातार सफलता पूर्वक वो पंचांग पत्रिका का प्रकाशन कर रहे हैं और आज देश की सर्वाधिक बिकने वाली प्रतियों में शामिल है। बिकने वाली प्रतियों की गिनती बीस लाख में है। कालनिर्णय प्रकाशन संस्था को चलाने वाले मुंबई के मराठी परिवार से ताल्लुक रखते हैं और पिछली दो पीढ़ियां इस काम को निहायत ही नित नए प्रयोगों के साथ संचालित करती रही हैं। योर स्टोरी ने कालनिर्णय प्रकाशक की दूसरी पीढ़ी के कर्ताधर्ता जयराज जी सालगावंकर से उनके दादर स्थित कार्यालय में मुलाकात की. This year, for the first time in 44 years, the almanac that Indian mothers swear by, Kalnirnay, introduced non-vegetarian recipes. Ever since, feedback has been pouring in on their Facebook page and Twitter handle. Not all of it is flattering. “How could you do this? We hang the calendar near our temple,” read one comment. Together with going ‘carnivorous’, the team made one more change. They did away with the section that carried the outstation train schedule. “We pride ourselves in being relevant. Everyone now books railway tickets online. And who doesn’t want to try a new recipe in their kitchen?” says Shakti Salgaokar-Yezdani, 32, executive director with the firm. Forget Nostradamus. When it comes to prophesying, they say, few hold a candle to Old Moore’s Almanac. The ‘they’ being the Irish. Old Moore’sloyalists swear the 251-year-old astrological handbook got it right on everything from 9/11 to the 2014 Irish heatwave. One of its forecasts for 2015? That the Brad Pitt-Angelina Jolie marriage is on shaky ground. India’s Kalnirnay is no crystal ball gazer. 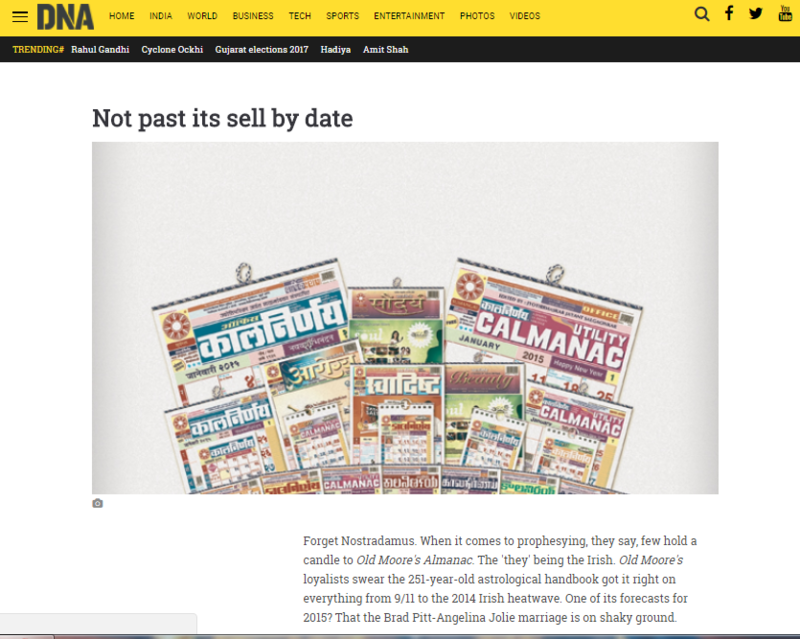 But this calendar-almanac, founded in 1973 by Jayantrao Salgaokar, is so pivotal in Indian households that many line up to buy the following year’s edition in early December itself. Well, it used to be that way. My grandmother fretted at the thought of kirana stores or newspaper vendors running out of the calendar just before New Year. “There’s always a rush for it,” she’d say, thrusting Rs10 in my hand so I could get her the prized possession. Even as Jayraj Salgaokar dips home-made biscuits into tea he wistfully recalls the previous day when he delivered a lecture to post graduate economic students at the University of Mumbai. He was invited by the faculty of his old alma mater to discuss key trends for private enterprise. He is thrilled. And why not? Today, he is publisher and managing director of Sumangal Press which is a Rs 55-crore company. It prints seven languages of Kalnirnay in various formats and sizes. In 2010, the company sold almost one crore 25 lakh copies of Kalnirnay. This makes it the world’s largest selling almanac. 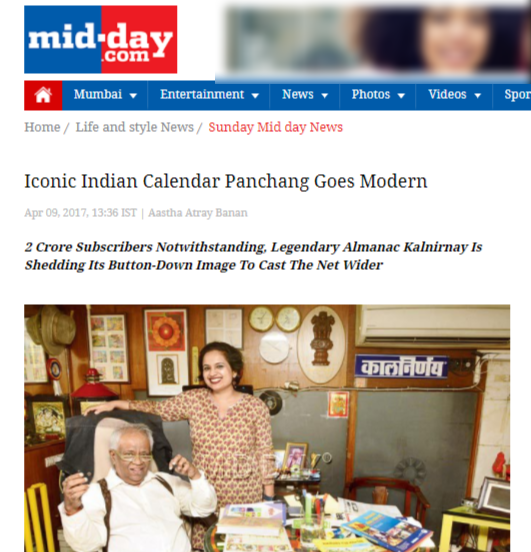 The Indian print industry has always lacked charismatic figures who are public icons. Kalnirnay is a rare exception. Every year, billboards, bus panels and strategically placed advertisements herald the arrival of Kalnirnay. Households in Maharashtra are incomplete without a Kalnirnay. 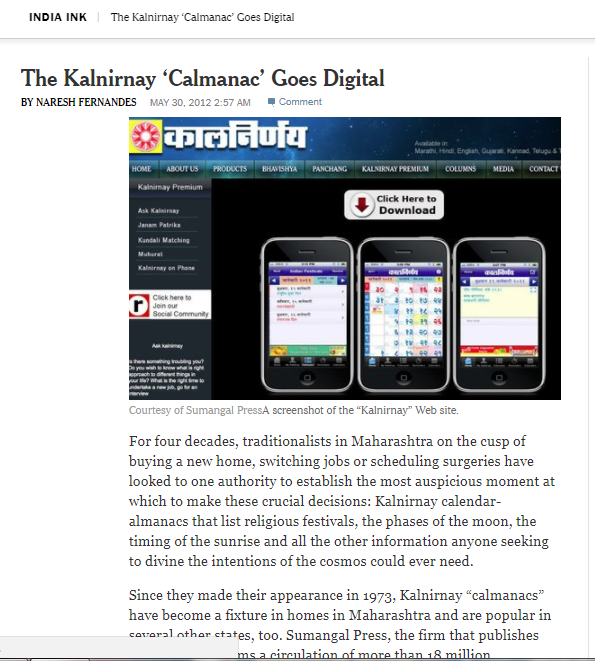 For four decades, traditionalists in Maharashtra on the cusp of buying a new home, switching jobs or scheduling surgeries have looked to one authority to establish the most auspicious moment at which to make these crucial decisions: Kalnirnay calendar-almanacs that list religious festivals, the phases of the moon, the timing of the sunrise and all the other information anyone seeking to divine the intentions of the cosmos could ever need. Since they made their appearance in 1973, Kalnirnay “calmanacs” have become a fixture in homes in Maharashtra and are popular in several other states, too. Sumangal Press, the firm that publishes the calendar, claims a circulation of more than 18 million. But now, as the firm looks at the charts to determine its own destiny, it seems that the future is increasingly digital. The revenues from the firm’s information technology products – such as horoscopes delivered to cell phones, its iPad app and a Website that generates cyber-predictions about such matters as “family welfare,” “buying gold” and “personality/anger management” – are set to grow at 300 percent this year. They constitute approximately 5 percent of the firm’s $4.5 million in total revenues, but Jayraj Salgaokar, the firm’s publisher and managing director, expects that figure to grow much quicker during the next decade. “I’m driven by technology,” he declared. Mumbai: Big Bazaar and its affiliate retail formats may have made Rs150 crore in additional sales on Akshaya Tritiya, considered an auspicious day for purchases, particularly gold. It was celebrated this year on Sunday. 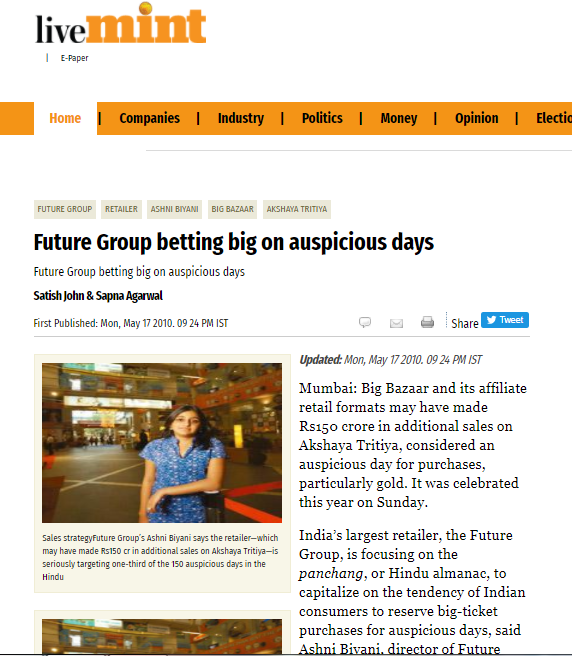 India’s largest retailer, the Future Group, is focusing on the panchang, or Hindu almanac, to capitalize on the tendency of Indian consumers to reserve big-ticket purchases for auspicious days, said Ashni Biyani, director of Future Ideas, a part of the Future Group. She is the daughter of Future Group’s founder and chairman Kishore Biyani and spoke to Mint on Friday, before the festival. 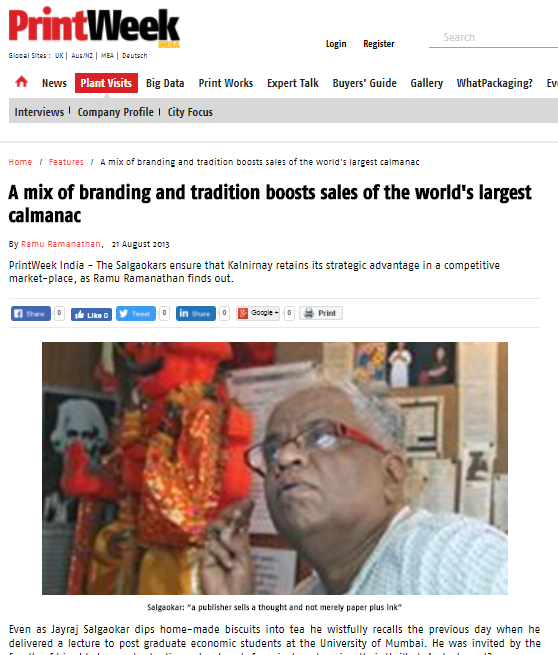 About 30% of total sales of modern retailers come from promotions centred around specific festivals and occasions, said Arvind Singhal, chairman, Technopak Advisors Pvt. Ltd, a retail consultancy firm. In an interview to Mint, Ashni Biyani, 23, said a team set up six months ago comprising experts on Indian mythology and religion, retail and even an expert on “days”, “seriously targeted” one-third of the 150 auspicious days in the Hindu calendar.